The PSAR, which stands for Parabolic Stop And Reversal, is an indicator that is most effectively with financial instruments that trend for long periods of time. In other words, a stock or fund which tends to move without any clear “up” or “down” direction will produce many false signals with this indicator. By way of example, here is Alphabet, Inc. (GOOGL) with a PSAR overlay. The PSAR is shown as a series of dots which are either above the price bars or beneath the price bars. If above, the PSAR is suggesting a downtrend in that stock, and these dots will “flip” to the other side if the trend likewise flips. 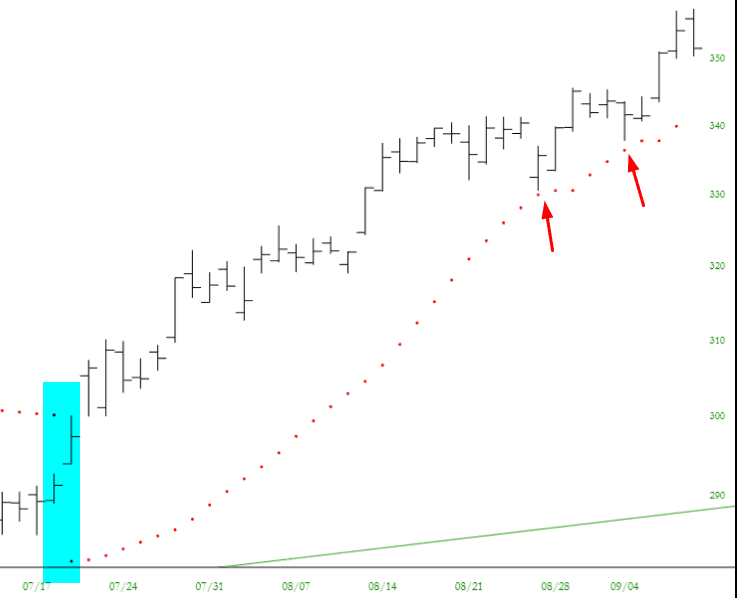 In this instance, the highlight area shows where the stock flips from downtrend to uptrend. The red arrows in the chart above highlight points where the price “threatened” to break the PSAR but instead found support. So long as prices do not violate the PSAR, the dots will remain on the same trend side. Otherwise, they will flip to the other side, reversing the trend. As suggested, financial instruments that lack trend will have this “flip” take place so many times as to be useless. Besides setting the color of the dots, you have two other points of control – the Acceleration Factor and the Maximum Acceleration. 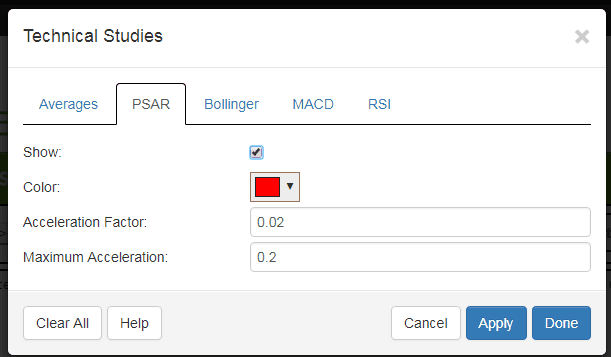 The suggested values are set by default, but you can alter these to make the PSAR more sensitive (and thus more volatile). Higher values (such as .04 instead of .02) will increase sensitivity while lower values will have the opposite effect. The math behind the PSAR is beyond the scope of this overview, but there are excellent articles with deeper information on the PSAR here and here.